After DMK Chief M K Stalin, AMMK leader T T V Dhinakaran Sunday backed off from attending the valedictory function of MGR centenary celebrations, questioning its legitimacy. Speaking to reporters here, Dhinakaran said the ruling party was luring people by paying Rs 1,000 per head to attend the event in Chennai and create a false impression that the cadre were with it. "...for a party that does not enjoy people's support, the event is being organised to create a false impression that the cadre were with them," he said. All the loyal workers have deserted the party and joined Amma Makkal Munnetra Kazhagam (AMMK), which would reflect in the coming general elections, where the ruling AIADMK would lose it security deposit, he claimed. On the inclusion of his name in the list, the AMMK leader said, "They have included my name along with other MLAs as per protocol. 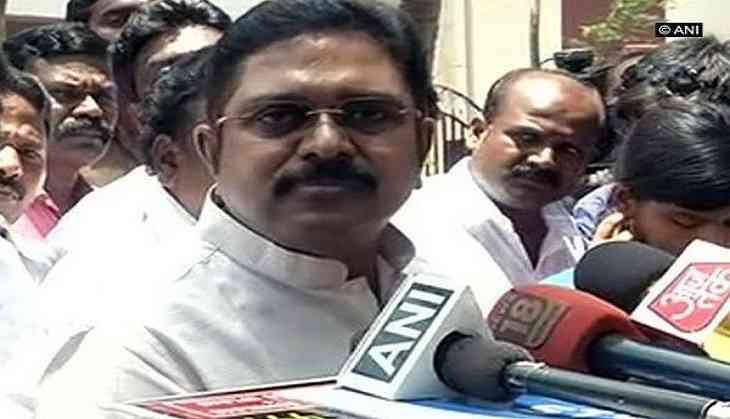 If they really wanted my presence, they would have checked my availability," Dhinakaran said. Accusing the AIADMK government of using late leader M G Ramachandran's birth centenary for "political mileage", DMK president Stalin had Saturday said he would not take part in the valedictory function in Chennai. The AIADMK has invited arch rival DMK President M K Stalin and ousted leader TTV Dhinakaran for valedictory of party founder and late chief minister M G Ramachandran's birth anniversary celebrations, raising a few eyebrows.